Facebook has grown into the world’s biggest social network, and despite its decline in the last couple of months, it’s still unbeatable. Now, the company seems to be thinking of ways to combine the overall user experience across both Instagram and Facebook. While Facebook and Instagram are already well associated, the company is planning to link Instagram with Facebook Messenger as well. As reported by a user on Twitter, Facebook is currently working on a new feature for the Facebook Messenger that will enable you to sync with your Instagram Account while on Facebook Messenger. For those of you who are confused as to how this works, let me explain. While Facebook Messenger already allows you to add your Instagram account, there’s no option to sync it at the moment. 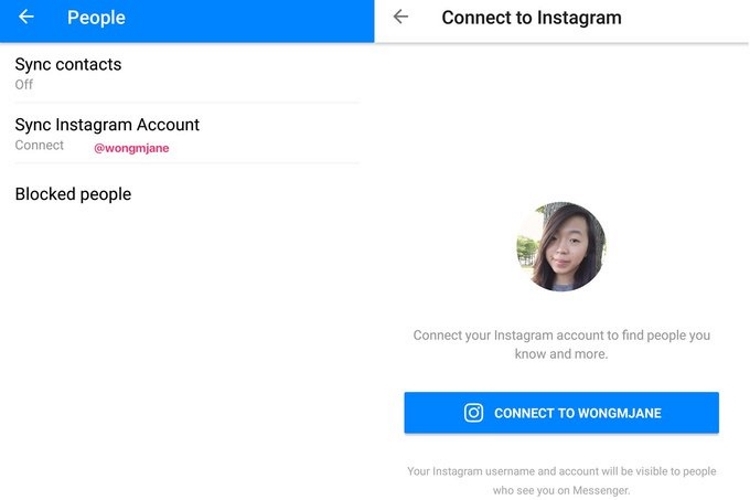 However, the aforementioned new feature will replace the basic Instagram Account option, which can be found in the Profile, under the People menu, along with Sync contacts and Blocked people options. Once you’ve synced your Instagram account with Facebook Messenger, you will have access to the Facebook Messenger accounts of your Instagram friends, so as to allow you to converse over there, instead of conversing via Instagram Direct (go figure!). The new feature is reportedly said to be in testing and is available to only a handful of users. It remains to be seen when the feature would go live for the masses.